We're also joined by this week's special guest, Mike Allton. Mike is the CMO SiteSell and also runs the social media blog, The Social Media Hat. In LinkedIn news, they are adding video geofilters. This is what LinkedIn video geofilters look like. These may look familiar. That's because LinkedIn is borrowing geofilters from Snapchat. The way LinkedIn's geofilters work is if you're at an event where the feature is enabled, you'll have the option to add them to your videos from the LinkedIn app. A few interesting bit of information about the LinkedIn video geofilters - if you're at a conference, they can display the conference badges with the person's profile photo in the right corner. If that person is a speaker at the event, the geofilter will indicate this if they are sharing a video. According to LinkedIn, "the new filters are meant to encourage the professional networking site's users to share their authentic first person views of work." As a business, we're excited for LinkedIn video geofilters. We could see these being used a lot at conferences and events. They'll also help bring users back to LinkedIn who have dismissed it as a digital rolodex, rather than a social network. Right now, LinkedIn video geofilters aren't available yet - they're only being tested by a handful of events. Expect more information soon. You can read more about LinkedIn video geofilters here. In Instagram news, you can now add interactive poll stickers to Stories. Instagram is adding interactive poll stickers to your Instagram Stories. With interactive poll stickers, you can now ask questions and see results from your followers as they vote in real-time. When people start voting, they can see which choice is the most popular. With Instagram interactive poll stickers, it is important to look at your results as soon as possible. This is because they disappear after 24 hours. When you're using Instagram Stories, you'll also notice some new features. For example, there's a color picker for text as well as alignment tools for text and stickers. You can read more about interactive poll stickers in Stories on the Instagram blog. Also this week, Instagram started rolling out the ability to cross-post Instagram Stories to Facebook Stories. In an effort to further integrate Facebook and Instagram, Instagram Profiles can now start sharing Stories to Facebook Stories (link). While you won't be able to cross-post Instagram Stories from a business account yet to Facebook Stories, this is a good move to begin to further integrate Instagram and Facebook. Another important thing about cross-posting Instagram Stories, this should help to eliminate manually syndicating your Stories and should save you some time. Hopefully more of Facebook's properties (Facebook, Instagram, WhatsApp and Messenger) will be able to be cross-posted. You can read more about cross-posting Instagram Stories here. In WordPress news, you can now choose from your Google photos when adding photos to your WordPress.com blog. As a business owner, you already have a lot going on. Managing a blog is just one more thing to do. Fortunately, WordPress.com is making it easier for you to work on your blog from your laptop or mobile device. Instead of having to collect all of the photo you want to use in your blog post, you can now add them to Google Photos and then pull them into your WordPress.com blog. This is a real time-saver because it eliminates an extra step. Simply add all of your photos to Google Photos and then when you're composing a blog post on WordPress.com, add your photos from there. To learn how to add Google photos to your WordPress.com site, go here. In Pinterest news, they are offering brands access to their visual search technology in order to score large ad deals. In an effort to boost interest in spending money with Pinterest, they are offering brands access to their visual search technology. If you're not familiar with Pinterest's visual search technology, you can snap a photo of something and it will bring back similar items online. Right now, Pinterest's biggest deal is with Target. The visual search technology has been customized to where it shows related Target results - great for upsetting other Target merchandise. As a business, you may have written off Pinterest. We say don't count them out. We could see their visual search technology being useful for retailers to help identify related products or complete outfits. Grocery stores could further use Pinterest's visual search technology to help identify recipes. People in the beauty or skin care industry could use it to identify related products, different tutorials with a particular line and more. You can read more about Pinterest visual search technology opportunity go here. In YouTube news, they are making a number of updates to YouTube Studio. YouTube Studio is adding some important new features to make it easier for your business to manage your YouTube channel from your mobile device. The first are scheduled posts. Now, you'll be able to schedule posts right from the YouTube Studio app. Simply pick the time, date, and video type - you can choose private, unlisted or public, and schedule it. YouTube Studio is also adding subscriber count cards. YouTube subscriber count cards make it easy for you to see how many new subscribers you've added to your channel. As a business, both of these updates should help you schedule your content when you know you'll be busy. You also won't have to wait to check your subscriber growth on your channel for when you're back at your desk. You can read the announcement about YouTube Studio updates in this article. In Snapchat news, advertisers can now use 3D World Lenses. Snapchat 3D World Lenses make it easy for you to bring characters and products to life in Snapchat. Now, advertisers are going to get access to use them in Snapchat Ads Manager. With 3D World Lenses, businesses are going to be able to pinch and resize their objects to move them around in space. These will give your business a way to inspire engagement, drive awareness and increase consideration towards making a purchase. What we like about 3D World Lenses is that they'll make it easier for brands to add a Lens that Snapchatters can "try before they buy." You can read the announcement about 3D World Lenses on the Snapchat blog. In Facebook news, they are testing using facial recognition to login to your account. You keep a lot of sensitive information on your mobile device. What if it were stolen and someone had your passcode? In an effort to provide better security to your personal data, Facebook is testing its own version of Apple's Face ID. What this will do is if you get locked out of your Facebook account, the company can use facial recognition to help verify your identify and unlock your account. Where we're currently at, this could be especially useful, because we don't always have access to two-factor authentication through SMS when traveling overseas. As a business, you might share access to your account (we don't recommend doing this). By having facial recognition, you'll be able to quickly unlock your account should you get locked out. You can read more about facial recognition on Facebook here. The first tool that we have discovered this week is called Enlight Videoleap (iOS). While there is no shortage of video editing apps, many of them lack a lot of the professional features such as green screen editing, masking and more. With Enlight Videoleap, video editing on your mobile device has taken a big leap forward. Not only do you get an easy-to-use interface for basic video editing, you also get professional editing features such as green screen editing, the ability to add color to parts of your clips, adjusting tones and more. Enlight Videoleap is available as a freemium download, with additional add-ons available for purchase, starting at $3.99. You can download Enlight Videoleap from the link below. The second tool that we have for you this week is called Animator (web). Would you like to create more video content for your blog or social media channels? With Animaker, you can create your own animated videos for your content, to promote your business, to educate customers, for story telling and more. What we like about Animaker is that it is extremely easy to use. You also don't have to hire a video editor. Instead, you can create your explainer videos yourself and give your brand a boost. Here is a short video on how Animaker works. Animaker is available in a free version. From there, plans start at just $9 per month (annually), depending on how many videos you need to create. You can start using Animaker from the link below. 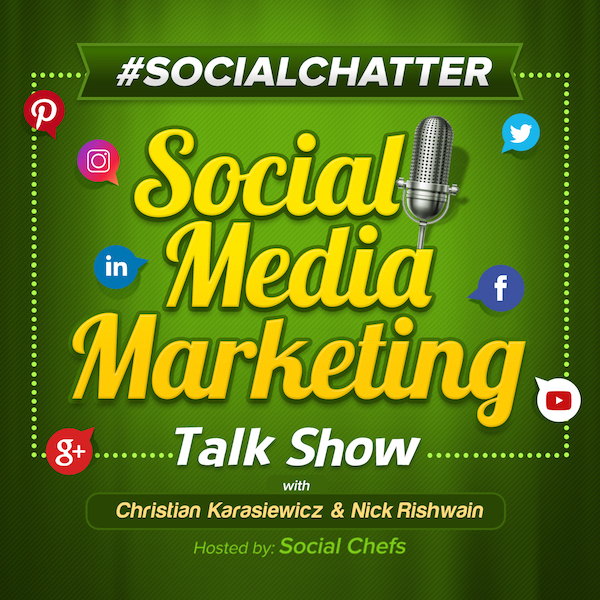 To watch next week's episode of Social Chatter, your weekly social media marketing talk show, tune-in here to find out what's new in social media news!